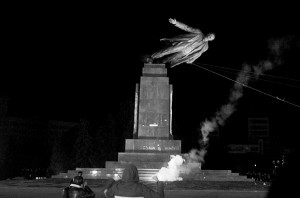 If this is who is tearing down statutes across Ukraine, including now eastern cities like Kharkiv, then to answer the Washington Post’s question as to what it “signals for Russia,” is a Nazi threat openly backed by the European Union, NATO, and the United States, lurking once again along its borders just as it did in the 1930′s and in immediate need of being addressed. This threat goes unnoticed to most among Western audiences primarily because of dishonest reporting from papers like the Washington Post as well as the West’s continuous campaign to defame and undermine Russian media who has apparently been accurately reporting the growing Nazi threat in Ukraine for some time. …there is an increasing worry that while the Azov and other volunteer battalions might be Ukraine’s most potent and reliable force on the battlefield against the separatists, they also pose the most serious threat to the Ukrainian government, and perhaps even the state, when the conflict in the east is over. The Azov causes particular concern due to the far right, even neo-Nazi, leanings of many of its members. As usual, while the Western press invents an impressive cast of villains for Western regimes to intervene against, it is their own proxies who often pose the greatest threat to global peace and stability. Nazis ravaging not only the West’s enemies in eastern Ukraine, but now threatening their own proxy regime in Kiev is just one of many examples.